A location is a set of maps, which are all stored in auto.master, and a location can store multiple maps. The location entry only works as a container for map entries; it is not an automount configuration in and of itself. Identity Management does not set up or configure autofs. That must be done separately. 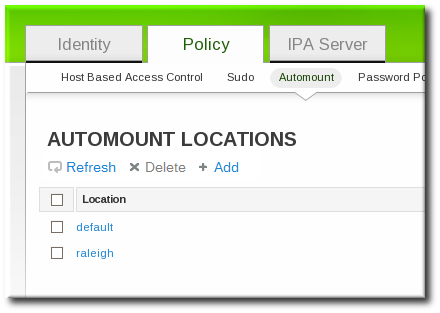 Identity Management works with an existing autofs deployment. Click the Add link at the top of the list of automount locations. Enter the name for the new location. Click the Add and Edit button to go to the map configuration for the new location. Create maps, as described in Section 18.5.1.1, “Configuring Direct Maps from the Web UI” and Section 18.5.2.1, “Configuring Indirect Maps from the Web UI”. To create a map, using the automountlocation-add and give the location name. When a new location is created, two maps are automatically created for it, auto.master and auto.direct. auto.master is the root map for all automount maps for the location. auto.direct is the default map for direct mounts and is mounted on /-.